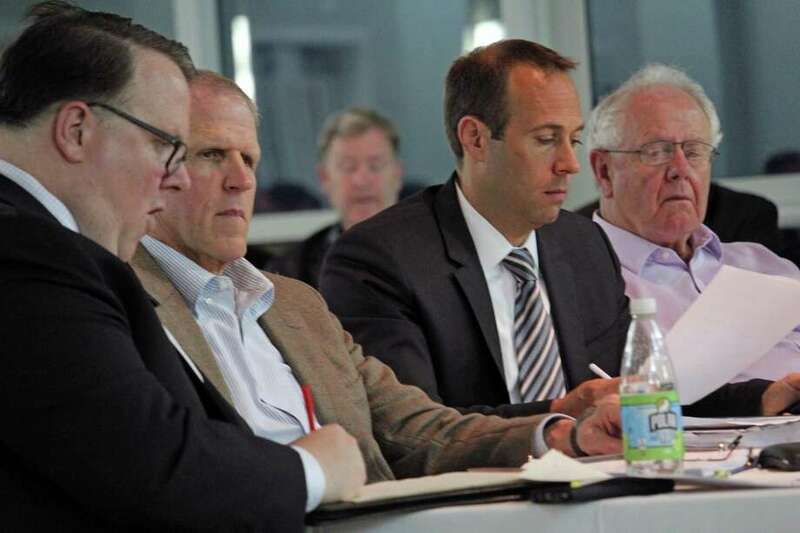 FAIRFIELD — Ignoring warnings from their Republican colleagues on the finance board, the GOP majority on the Representative Town Meeting Monday adopted a budget that slashed $825,000 from the contingency account. For the most part, votes at the annual budget meeting split cleanly across party lines. The final $298,491,556 spending plan for 2017-18 reflects a 1.45 percent tax increase and translates to a tax rate of 25.82 mills. The final mill rate, however, will be set by the Board of Finance when it meets Thursday at 7:30 p.m. in the Board of Education conference room. Board of Finance Chairman Thomas Flynn cautioned the legislative body against cutting any of the $1.2 million his board put into the contingency account. Flynn said the purpose behind that money was three-fold and provided flexibility given the uncertainty of state revenue. If the town loses more under a final state budget, he said, or if the town’s own revenue projections fall short, this account will give them some room to maneuver. And if the money isn’t needed to fund shortfalls, Flynn said, it can be used to fund investments in Public Works trucks and paving, and the library. Flynn and other officials warned that these cuts set up a bigger fiscal cliff for the town next year, guaranteeing a larger tax increase. Democrats on the RTM, noting the finance board’s rationale for the contingency funding, said the GOP amounted to a de facto cut to the library system, Public Works, and possibly the Board of Education. “We put the money into contingency to allow us the flexibility on how it would be used,” Flynn said, because of concerns about revenue. In a move that came as a surprise to department heads, the GOP also made motions to cut the first selectman’s chief of staff position to part-time, cut out a clerk in the tax collector’s office, eliminate the administrative assistant in the Registrars of Voters office. The administrative assistant is the only full-time position in the Registrars’ office. While the first two motions were approved in 20 to 19 votes, the vote on the administrative assistant failed when it ended in a 20-20 tie, thanks to the defection of Eric Sundman, R-10. The GOP moves cut $47,754 from the first selectman’s payroll, and $51,156 in the tax collector’s budget. Another $43,930 corresponding reduction was made in employee benefits because the chief of staff will not receive benefits. Even worse, Pires said, is that the GOP moves with the contingency account exposes the town to significant mid-years cuts to town services and sets the town up for larger future tax increase to cover costs and services the town will be uable to fund this year because of that cut. First Selectman Mike Tetreau said if the town sustains an even larger hit to revenues than anticipated due to the state budget, there are two areas where cuts would be made — the library and Parks and Recreation. Those are the two areas, he said, that the town is not legally required to provide to residents. “We have to be fiscally responsible, we have to do more with less,” said Peter Ambrose, R-1, speaking in support of the contingency cut.